This Sunday, July 17 at 2pm Rockport Music is presenting a “Young Artists Piano Virtuoso Showcase” celebrating the 200th anniversary of Franz Liszt’s birth at the Shalin Liu Performance Center in Rockport, MA. Three of the four performers are From the Top alums: George Li (Show 144 in Boston, MA), Charlie Albright (Show 066 in Bloomington, IN) & Jee Hae Ahn (Show 213 in Burlington, VT). Tickets are $30-55 and more information can be found on their website. The Shalin Liu is a beautiful performance space where we recently taped a radio show. There’s a stunning view of the coastline from the stage! Click here to see more pictures from our Rockport taping. 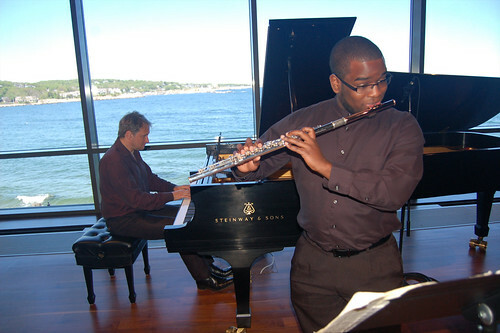 17-year-old flutist Ryan Norville performing on From the Top at the Shalin Liu Performance Center.